There are many great reasons to utilise solar power in your homes – as a natural resource, it is better for the environment and helps to reduce reliance on limited supplies of fossil fuels. However, many Australians think that the costs outweigh the benefits of investing in solar technology. Some of these common concerns include the belief that a solar power system will never produce enough energy to pay back the amount that was used to create it in the first place – rendering it a rather inefficient power source – and that solar panels are not trustworthy due to unreliable workmanship. However, there are those that believe that such beliefs are unfounded. According to Giles Parkinson from RenewEconomy, solar panel installation is not a sunk cost. He refers to statistics from Muriel Watt, the chair of the Australian PV Association (APVA), which illustrate how the energy payback of solar PV systems is actually quite quick, though the exact energy payback time for solar PV is subject to a number of variables. These variables include the type of cell technology, PV system application, irradiation, sources of energy used in its manufacturing processes, and the energy PV will displace. 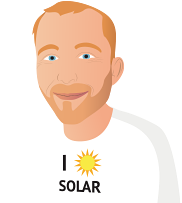 Mr Parkinson states that the energy payback time for a 2 kWp rooftop system can be as short as two to three years – not long at all for a lifetime of renewable energy. Another common myth surrounding solar power is that solar installations are untrustworthy and not installed to a good standard. According to the Clean Energy Council (CEC) this claim is false – solar panels and inverters must comply with all relevant Australian standards and regulations, and all solar installers must be qualified as an electrician, as well as going on to have additional training and accreditation in solar power systems. If you are looking into solar power or clean energy solutions for your home or business, it is advisable to do your research to clear up any misinformation.